Jones still on point after West Point: At first glance, the tiptop of the Toyota Tundra Bassmaster Angler of the Year standings appears to be a snapshot of what it was before the May 5-8 Pride of Georgia event on West Point Lake. 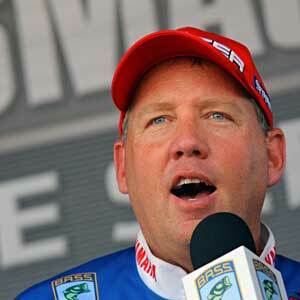 Alton Jones still leads, Terry Scroggins is still the runner-up, and Kevin VanDam is still in third place. The not-so-obvious difference is that there are 107 points between Jones and Scroggins, and 118 points between Jones and VanDam. Jones of Waco, Texas, wrapped up another stellar performance and with it, the fifth-round claim to the lead in the 2011 race for Toyota Tundra Bassmaster Angler of the Year. Jones finished in sixth place at the Pride of Georgia, the fifth of eight events in the regular Bassmaster Elite Series season. That gave him enough points to secure the points lead for the fourth consecutive time. “I’ve got to keep saying it: This is not a sprint, this is a marathon. Now, the last tournament — that’s going to be a sprint. But right now, it’s about consistency; it’s about making Top-12 cuts and high finishes,” Jones said. He contends that his TTBAOY goal is helping him narrow his focus on the water. “It’s fun to have the ‘big goal’ out there of Angler of the Year, but that’s got to be for between tournaments. When I’m on the water, the goal is the next fish. Every ounce is critical. I’m thinking about that with every cast, being real careful, making sure that I’m presenting the lure to make a catch that will help me,” Jones said. Other big movers in the TTBAOY standings included Ish Monroe, up 29 places into 35th; Denny Brauer, up 17 places to 28th; Jared Lintner, up 15 ticks to settle in at 12th; and Bobby Lane, who helped himself into 20th place with a Top-12 finish in Georgia. Lane’s advancement from 31st in points was also significant in that he’s now above the Bassmaster Classic cutline of 28th place — a long struggle since his bad start in Florida on home water. He and his brother Chris now are on track to qualify together for the 2012 Classic, which has happened only once before, in the 2008 Classic. 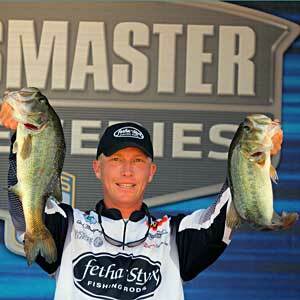 With three events left, he hasn’t thrown in the towel in the Angler of the Year race. DeFoe vs. Montgomery? No way: Ott DeFoe now leads Andy Montgomery by 48 points, but no one should expect a contentious rivalry between them for this season’s Bassmaster Rookie of the Year award. While the current frontrunners would like nothing more than to claim 2011 rookie bragging rights, DeFoe, 25, and Montgomery, 27, just so happen to be roomies on the road (it’s a way to shave the cost of travel) and the best of friends. Sunday, May 8, as the Pride of Georgia competition ended, DeFoe of Knoxville, Tenn., speculated whether the official points tally would have his friend from Blacksburg, S.C., in the top spot. Fishing the same pattern, Montgomery suggested a bait adjustment to DeFoe after the first day when Montgomery was in 11th place and DeFoe struggled in 57th place. Defoe took the advice and sacked a 17-2 bag because of it. 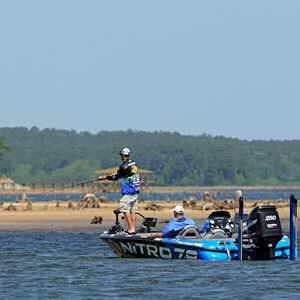 By Day Three, they were both fishing well enough to score Top 12s — DeFoe’s first, Montgomery’s second consecutive. The tournament ended with DeFoe in 11th place. Montgomery ended in ninth place and with seven points more than DeFoe collected. Still, he didn’t surpass his buddy in the Rookie of the Year standings. Few seasons have seen two rookies so high in the overall Toyota Tundra Bassmaster Angler of the Year points standings after five events. DeFoe sits in sixth place, and Montgomery is 10th.